NOWHERE on earth are there more plentifully preserved monuments and relics of an ancient Egyptian civilization. They have sustained the ravages of time, vandalism, invasions, conquests and grave-robbers. The tombs and temples were built on such a grand scale, the murals and statues executed with such artistic skill, and craftsmanship had reached such a degree of perfection, that they will ever lure man to a realisation of his heritage. ‘Egypt contains more wonders than any other land in the world, and is pre-eminent above all the countries in the world for works that one can hardly describe,’ wrote Herodotus. Though much of Egypt’s portable treasure today adorns the museums of the world, the Egyptian Museum in Cairo naturally boasts the most valuable and comprehensive collection. Founded by the French Egyptologist Mariette in 1882, its contents are arranged in chronological order (though the heavier stone statues, stele and sarcophagi are on the ground floor). 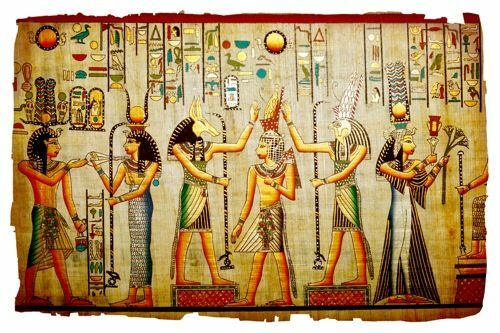 They range from neolithic artifacts and pottery to statues and portraits of the Greco-Roman period; five thousand years of Egypt’s ancient history. There are statues, stele, murals, sarcophagi, texts, jewellery, etc, of all periods, including the Hetep-Heres collection of royal furniture of the Old Kingdom, the famous Tutankhamon Collection, a Collection of the Tanite Kings (21st/22nd dynasty) which represents the largest collection of gold and silver work in the museum, the Ikhnaton Collection including statues of the pharaoh himself, exquisite paintings from his Sun Temple at Tel el Amarna, and a superb bust (unpainted) of his wife Neferteti. 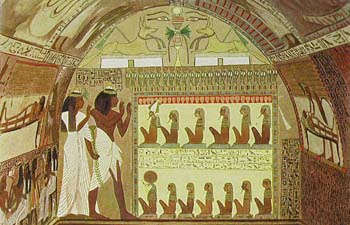 There is also a Mummy Room containing forty mummies of some of Egypt’s most important pharaohs (including Amenhotep I, Thutmose II and III, Seti I, and Ramses II and III) which were recovered from a shaft at Der el Bahri (Luxor Egypt), where they had been hidden by the priests of the 21st dynasty for safety against grave robbers. Most of the works described in this study may be found in the Egyptian Museum, including the famous diorite statue of Khafre pharaoh, statues of Menkaure king between Hathor and local deities, the ‘Sheikh el Balad’, Ra-Hotep and Nofret, the copper Pepi I's statue and his son, the statue of Ti, the nobleman whose tomb we have described in detail, and the granite sarcophagus of Menerre (procured by Uni who excavated five canals at the First Cataract to transport the barges to Memphis) to mention but a few. These, of course, are apart from objects of a non-funerary nature: combs, mirrors, furniture, weapons, tools, etc. The contents of the Museum, however, represent but a small part of Egypt’s treasures, for indeed the whole of the Nile Valley is an outdoor museum. Following the ancient highway, the river Nile, we will briefly view some of the surviving monuments that lie between Giza, opposite Cairo, where the Great Pyramids of Khufu Pharaoh straddle the desert plateau, and Abu Simbel, over 600 miles further south, where the gigantic statues of Ramses II king sit in massive dignity at the entrance of his famous temple above the waters of Lake Nasser.